Spoiler alert: This story has a happy ending, but it took months to get there. I didn’t want cash or an iPhone repair. I was looking for the only business in New York City that could fix my shattered Apple Watch screen. My search proved futile, but you can take a lesson from my tale of woe: Consider AppleCare+ if you're buying an Apple Watch, because Apple is the only reliable repair service I could find. I’m not a clumsy person. I’ve owned multiple iPhones and never so much as scratched them, let alone dropped them on their faces. 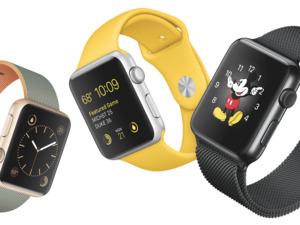 My Apple Watch was always affixed to my wrist, I thought. What harm could come to it? So when I excitedly preordered my 38mm Apple Watch Sport the instant it went on sale, I didn’t think to buy AppleCare+. The day before Thanksgiving, I came to rue that decision. I was traveling for the holiday and staying at a friend’s house. My stuff was strewn about the guest bedroom, with my most important belongings—keys, wallet, Apple Watch on its charger—on the dresser. As I picked up my wallet to toss it in my bag and head out the door to see my family, I realized too late that my watch had been balanced ever so slightly on the wallet, just enough that moving it shifted the Apple Watch. It slipped off the dresser and onto the floor. The tiled floor. On its face. Before I even turned to pick it up, I knew what it would look like. Yeah, it was bad. The Ion-X glass that Apple says is “especially resistant to scratches and impact” didn’t survive a 4-foot drop onto a hard surface. I immediately called Apple’s support line in the hopes that I could take it to an Apple Store for a screen replacement. 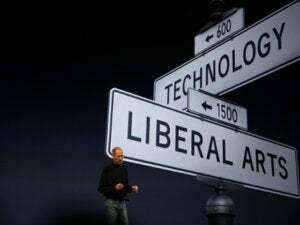 A friendly fellow named Andrew told me that without AppleCare+, I was looking at a $256.89 bill. 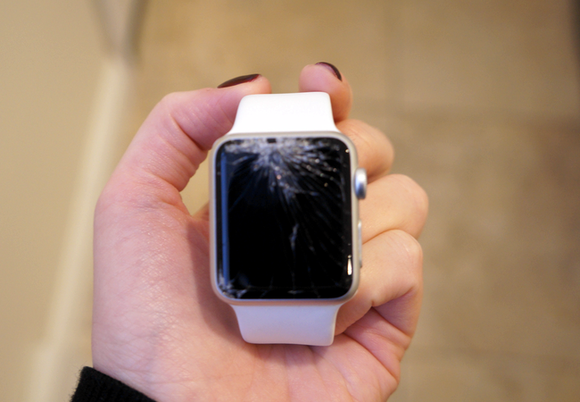 Apple doesn’t repair damaged watch screens, he explained. They just send you a replacement watch. 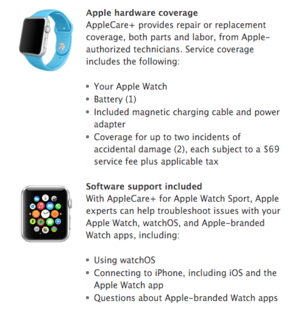 If I had purchased AppleCare+ for the watch, which is $49 plus tax, a replacement would have cost me $69 plus tax—Apple’s service fee for accidental damage. As Andrew broke down the math for me, I fell into a pit of despair. 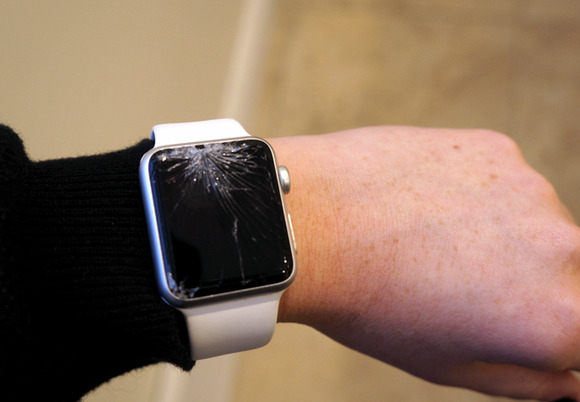 A brand-new Apple Watch would cost just $100 more than replacing the damaged one. The holidays were just around the corner and I had gifts to buy and flights to book. A vision of my wallet bleeding money popped into my head. Maybe the damage isn’t so bad, I thought. Sure, the screen looks like I bashed it with a hammer, but it still recognized the force of my touch and I could kind of read the text on it. People walk around with broken iPhone screens all the time, and though I always wonder how they manage to not slice their fingertips open, they seem to get by just fine. 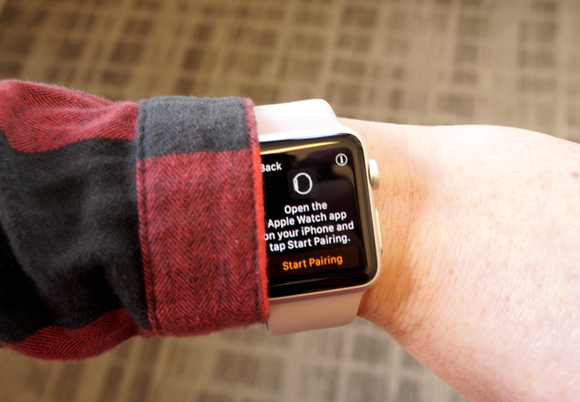 But there was no way I was going to stare at a cracked Apple Watch screen on my wrist every day of my life. So when I returned to New York, home of countless iPhone screen repair shops, I decided to make some calls to see if I could get my watch fixed on the cheap. Going to a third-party repair shop voids Apple’s year-long warranty, but since I was eight months into that year anyway, I was willing to risk it to save some money. First I searched for “Apple Watch repair NYC” in the hopes that the top result would be my savior. No such luck. Two businesses popped up because they mention Apple Watch repairs on their website, but haven’t started offering them yet. AppleCare+ for the Apple Watch Sport would’ve saved me a lot of time and money. Only the third person? Great. I officially felt like the world’s (third) biggest klutz. Then I hit Yelp to see if iPhone repair shops in Manhattan that don’t advertise Apple Watch repairs would be able to help me out. No such luck. I called several businesses, none of which could repair my screen. This wasn’t going well. Maybe Best Buy could help me out, either with a repair (unlikely) or a referral to a repair shop (also unlikely, I feared). They had me on hold for 15 minutes, then I had to hang up before the holiday Muzak selections drove me to drink. I called a few more iPhone repair shops from Yelp, none of which planned to repair watches. “You’ll have to go to the Apple Store,” one told me. Well, at least they were honest. After calling close to 20 businesses, I decided to branch out of Manhattan and try the outer boroughs. I was willing to travel for Apple Watch screen repair. I struck gold in Queens. The first repair shop I called said that not only could they replace my screen, they had experience successfully repairing Apple Watches. It would cost $135. The savings sounded too good to be true, but I took three trains to Astoria and handed over $40 for a deposit on the glass, which had to be ordered from China. I was expecting to have my watch fixed before I left New York for the holidays. But the rest of December flew by. The shipment of glass, which had been expected to arrive in two weeks, was delayed overseas. Then I went out of town for three weeks, and before I realized it, January was over, too. 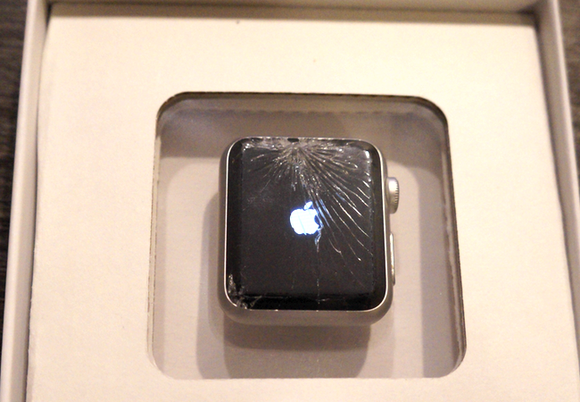 The first week of February, I finally heard back from the repair shop: The glass had come in, but it was no good. The owner had tried to fix another Apple Watch screen, but this glass didn’t recognize Force Touch. It was from a different supplier from the last batch, he told me. “It could be that their watch was so damaged that even a new screen couldn’t help,” he told me, offering to give mine a shot if I wanted. You must be joking, I thought. If the replacement display was botched, I wouldn’t be able to take it to Apple to reverse the damage. But I appreciated his honesty and pleasantly turned down his offer. I schlepped back out to Queens to reclaim my $40 deposit and then sat down to do what I should have done in the first place: I filed a repair request with Apple. 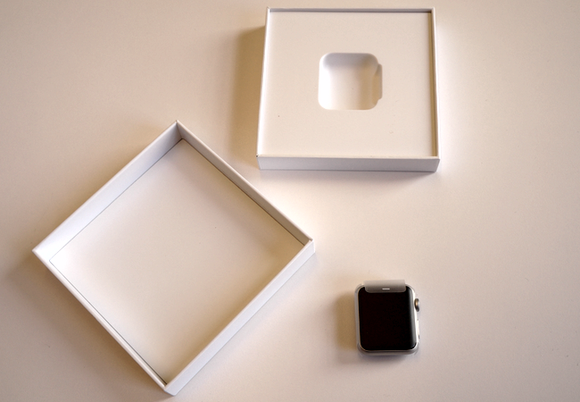 After you submit a repair request, Apple sends you a box to package up your watch and ship it back to them. The process was so simple I almost kicked myself for wasting months trying in vain to find another way to get it repaired. All you have to do is go to Apple’s support site, select which watch model that you need to be fixed, then unpair your device from your phone. I didn’t even have to dig to find my watch’s serial number because it was stored under my Apple ID. Within two days, a box from Apple arrived at my front door. I wiped the data from my watch, slid the face from its white Sport band, nestled it in Apple’s packaging, and dropped it off at FedEx. A day later, my replacement watch was on its way. A brand-new watch arrived on my doorstep within days. I don’t regret being a cheapskate, partly because journalism: Now I know that Apple Watch repairs are so uncommon that Apple might offer the only way to get the nearly 1-year-old product fixed, particularly if you live in a small town or rural area, and even if you live in one of the world’s largest cities. If you’re a DIYer, iFixit’s Apple Watch teardown offers a detailed guide to opening up the device yourself (and the site sells tools for getting the job done), but I’m not a risk-taker, especially not after this incident. I did learn the Apple Watch’s value to me, though. If I had damaged the screen of my iPhone or MacBook Air, I would’ve paid Apple any amount of money to fix it immediately, no cost comparisons necessary. I missed not wearing the watch, but I didn’t feel its absence acutely the way I would have with my phone or computer. It’s nice to have, not a must-have. I love my Apple Watch, but if I break it again, we’re through. But I’m back to wearing my Apple Watch nearly every day. I have a new lavender band to replace my dingy white Sport strap, and a watch dock to keep it safe. And if it happens to slip off its stand again, I’ll know that the Apple Watch and I just aren’t meant to be.